This is a used 1996 Polaris SLT780. 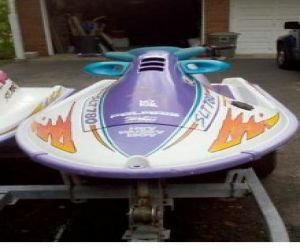 The engine is not in working condition, however the body is and is in great shape for an older jet ski. That and the drive shaft has go to be unbinded, it has gotten corroded from sitting in one place. This 1996 seat is a bit faded from the sun, but there is no other real damage to it. All of the padding is still in it. So you can have a comfortable ride once you can get this up and running. There are rubber grip mats on the floor so you can not slip over board. The handle bars are all in working conditions and have the proper grips on them. The body is in great condition for the age of this wave runner. There may be some small dings, but nothing that can even be noticed in the photos. This ski is white with purple and blue. There are some decals that are a few different colors on it. Towards the rear there is a hook that you can pull a wake boarder or water skier.